How to minimize the Risk of Visa Rejection ? Unfortunately, foreign students who take preparatory language courses in Germany, as well as foreign postgraduates, PhD students and scholarship holders at German universities and colleges, exchange students under programmes like ERASMUS+, DAAD, Erasmus Mundus, SOKRATES, Leonardo da Vinci, Comenius and Grundtvig cannot yet take out the German statutory public health insurance (like Techniker Krankenkasse TK, AOK, DAK, BKK or BEK for example) and thus, cannot use the cheap student insurance there. The same applies to all foreign students visiting a Studienkolleg in Germany that are more than 30 years old. They, too, are no longer eligible for the low-priced statutory health insurance. Nonetheless, health insurance in Germany is very important. You must be able to prove health coverage when applying for a visa at the German Embassy or Immigration Office. Without health insurance a visa will not be granted. Of course, you also need insurance to protect yourself from the extremely high medical costs in Germany. Charges for a visit to the hospital could easily be several 1,000 Euro. Unfortunately if you are in this situation, there are not many alternatives for you: You need to take out a special private health insurance for foreign students ( For example from 28 Euro/ month by "Hanse-Merkur Reiseversicherungsgruppe". More details here ... ). Similar to public insurance, the private health insurance will cover out-patient, dental and in-patient treatments by a doctor or in a hospital if you fall ill. The big difference: the private student health insurance offers good services at a very reasonable price ( from only 28 Euro/ month, More Details here ... ). The second advantage for Foreign students and language school visitors in Germany: shortly after the Online Application you will receive by email already your insurance documents as PDF Files. Since this private health coverage meets the official visa requirements, you can use immediately your insurance certificate for a visa application at the embassy or a visa extension at the local immigration office (Ausländerbehörde) in your city. What is included in the health insurance? Basic Medical Protection for Foreign students is included in the standard/basic tariff ( from only 28 Euro/ month ). With the Comfort tariff ( from 35 Euro/ month ) you may even be refunded part of your premiums under certain conditions. However, for persons who wear glasses or regularly have problems with their teeth, we recommend the Premium tariff, which offers the most luxury and extras ( from 63 Euro/ month ). In our opinion the health insurance by Hanse-Merkur Versicherungsgruppe offers one of the best services for foreign students and language school visitors in Germany at very affordable price. The monthly premiums are very low and start from only 28 Euro per month. If you need a Visa for Germany, very important for you is also the fact that you can apply directly online and a short time later you receive by email already your personal insurance documents as PDF Files. Please print out these PDF Files and use the documents for Visa Application or Extension at the embassy, consulates or the local immigration office (Ausländerbehörde) in Germany. In our experience, this Incoming Insurance for foreign students is accepted by the German Embassy abroad as well as by the local foreigner office (Ausländerbehörde) in Germany. You will receive your insurance documents via email normally within minutes of applying online. Print these documents and use the insurance certificate as proof of insurance for a visa application or visa extension. Who is eligible for this health insurance? all foreign students who are getting an education or training in Germany and/or Austria. For example: foreign language students attending German courses (i.e. private language school or education center like Volkshochschule), students attending a DSH /TestDaF preparatory course (DSH is the German language university entrance exam for foreign students), language students during a language holiday, foreign PhD students, participants of international projects at universities and colleges, scholarship holders, postgraduates, students who are part of an exchange program like DAAD, Erasmus or Sokrates, foreign students on Working Holiday, Work & Travel or Work & Study programs, as well as other further education and study trips abroad. In addition to private travel insurance for foreign students, it is highly advisable to take out a personal liability and accident insurance as a package. This is the only way foreign students can protect themselves from the high costs in case of liability for damage. Especially in Germany, the cost of self-inflicted personal injury or property damage can easily go up into the millions. However, for the small additional amount of only 2 Euro/ month foreign students can protect themselves from the high costs of claims. If you wish to do so, please answer "Yes" under the option "Do you want to take out liability or accident and liability insurance?" when filling out the online application. With this complete package you will be very well covered for the most risks during your stay in Germany or Austria. 1. Can I use this student insurance for obtaining my visa? Yes, this insurance meets visa requirements and can therefore be used as proof of insurance. In our experience, this health insurance for foreign students is accepted by both, the German Embassy abroad and also the immigration office (Ausländeramt) in Germany. Within just a few minutes after applying online you will receive an email with your insurance documents as PDF-Files. Please print these documents and use the insurance certificate as proof of insurance for a visa application or visa extension, for example. 2. I am already in Germany and need to extend my visa for a continued stay in Germany. Will this Incoming health insurance be accepted by the local immigration office ? Yes, simply take the insurance certificate you received per email as proof of insurance next time you go to the immigration office (Ausländerbehörde). In our experience, the Incoming Health Insurance by Hanse-Merkur Versicherungsgruppe is accepted by all immigration authorities in Germany. Hence, you can apply there for a visa extension at any time. 3. How and when do I receive my insurance documents? 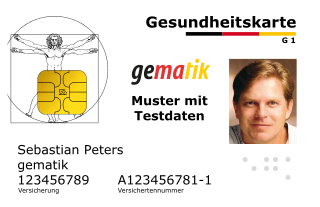 If your address is in Germany, an original copy of your insurance policy, pre-printed treatment vouchers and an insurance card will also be sent by mail. 4. 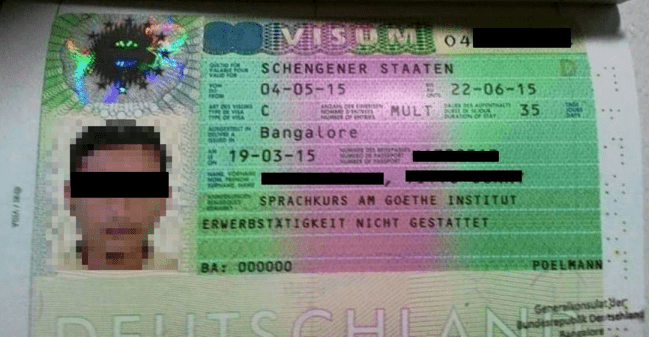 What if later on I do not receive a visa and cannot enter into Germany or Austria? 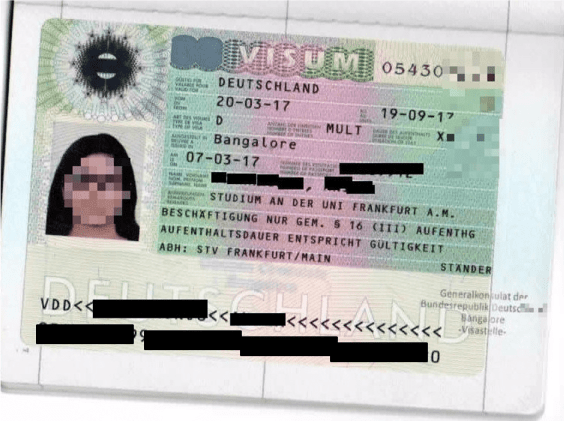 If a visa is not granted and as a result, you cannot enter Germany / Austria, you can simply cancel your application at any time before coverage begins. Please cancel your travel insurance in writing via email, mail or fax and include a copy of your letter of visa refusal. Please include all necessary data: insurance number, name and reason for cancellation, as this is the only way your request can be processed expeditiously. You can get a refund of paid premiums, less a processing fee of 5 Euro.